Since the dawn of the internet age some three decades ago, it has become increasingly more common for teams from distant corners of the globe to come together remotely. What was once novel is now commonplace. With access to an internet connection, a programmer in India can link with an engineer in Indiana and a product specialist in Innsbruck in real-time to push forward any imaginable product or project. Yes, the internet has made the process of instantaneously connecting specialists from all over the world possible. But, many businesses are coming to realize that sort of connectivity is only one piece of a larger puzzle in scaling a successful business. For more and more organizations, proximity—to technology hubs, networks of similarly complex organizations, industry talent, and interns—is becoming more of a priority. In recent years, a number of companies with an international reach have opened offices in the Iowa State University Research Park, each of them sharing a common interest in the benefits of having a physical presence in close proximity to the university. But not all companies with a presence in the Research Park were founded elsewhere. An equally valuable mix of tenants include those who are “home grown” like Parametric Studios, SmartAg, Nebullam and more. Iowa State is renowned as a research institution. From veterinary science to agricultural related pursuits, to a robust engineering program, there are new developments coming out of the university on a daily basis. And companies large and small are paying attention. “We have a significant interest in research being conducted at Iowa State,” says Kevin Gaul, Pella’s director of legislative and regulatory affairs and a key member of the team that spearheaded the effort to establish Pella’s Research Park office. Pella is making the most of its presence in the Research Park by setting aside lab space to assist students working on capstone projects. Gaul, who is an alumnae of Iowa State, says it is a win-win. Pella benefits from the work of students pushing the envelope in regard to technology, and students have access to a dedicated space to carry out their research. And Pella isn’t the only organization working to accommodate the groundbreaking work of students and researchers. Vermeer has dedicated the upper level of its building in the Research Park to host startups coming from the ISU Startup Factory and Agricultural Entrepreneurial Initiative programs. It also offers co-working space for rent by the hour, day or month. All of it is aimed at nourishing an environment of innovation. Mike Hogan, CEO of Calcium Products, says the developments coming out of the Research Park convinced his company to make the leap to Ames. In early 2014, Calcium Products moved its headquarters from Gilmore City to offices in the Research Park. 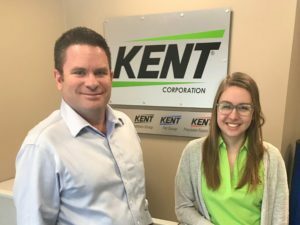 Pictured (l-r) are Kent Vice President of Innovation Jeff Underwood, and Jessica Schaumburg, an associate science intern at the Kent Innovation Office in the ISU Research Park. A similar judgement on the benefits of having a physical presence in the Research Park was rendered by Kent Corporation, one of the world’s largest agricultural feed manufacturers in the world. Underwood adds that he is optimistic about what the outreach effort in Ames will yield for Kent. Going hand-in-hand with research is talent. 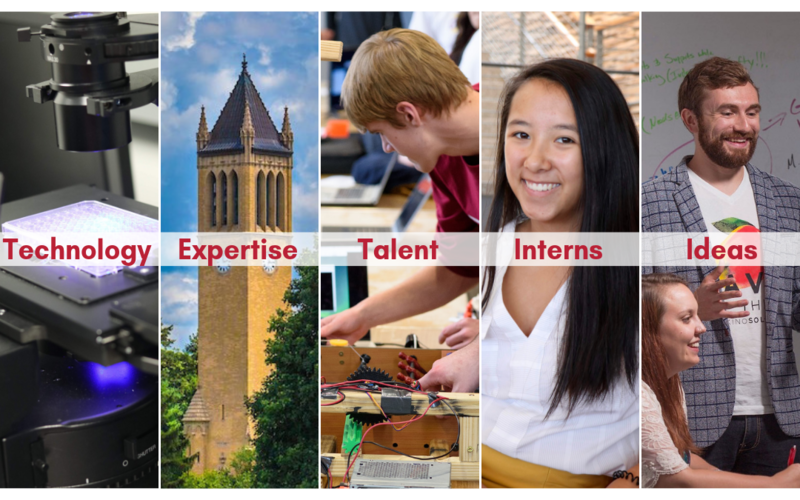 Iowa State’s enrollment has exceeded 35,000 in recent years, offering a rich recruitment base for employers seeking the best and the brightest in a competitive market for talent. Pella’s Gaul says the more opportunities they have available for students, the better. Kaly Etten, Leader of University Relations at aviation giant Collins Aeropsace, offers a similar assessment. Calcium Product’s Andrew Hoiberg, who serves as Vice President of Research and Development, says making it easy for students to find his company is valuable. Many of the companies in the Research Park offer robust internship opportunities to give students a look at what work in the real world looks like, without having to drop their studies for a semester or more. Katie Knott, an Iowa State alumna and Collins Aerospace Technical Project Manager, says that while her internship experience was remarkable some two decades ago, times have changed. Students want to be able to work while they pursue their studies. Taking a break has become impractical for many of today’s students. There is also a network effect to being located in the Research Park. From consortiums like the Cultivation Corridor to startup specific programs like the Startup Factory, and university-based resources like the John Pappajohn Entrepreneurial Center and the Office of Economic Development and Industry Relations—to name just a few—form an equally supportive base of resources for new businesses and established organizations opening up shop in the Research Park. For large, Iowa-based businesses Pella and Kent, discussions with similar-sized organizations helped them make the decision to open an office in the Research Park. There has also been a side benefit of having an office in close proximity to outreach offerings from some of familiar companies. And the environment of innovation extends to companies that are sometimes just weeks or months removed from the dawn of a new idea. The Startup Factory was brand new when Parametric Studio was admitted to the program in the summer of 2016. Founder Chris Whitmer says it was invaluable to have an immersive and structured program, in a supportive environment, to help get the company off the ground. “Together, it gave me a clear picture of what we needed to do as an organization if we were going to address the needs of the market, and succeed as a business,” he says. Gaul adds that the staff at the Research Park does a magnificent job of making the process of finding space simple.